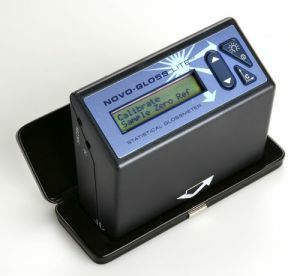 Product Description The Novo Gloss Lite NGL45 is a quality gloss meter at an excellent price! -Single measurement of 45 degrees optimized for gloss testing on specialized materials such as film, ceramics, textiles, and metals. Gloss Tiles: These can be used for two purposes. Only with a Rhopoint Novo Gloss can you calibrate on a standard that more closely matches your samples for improved results. The second reason would be to check the glossmeter for long term repeatability as a checking standard.